La Navidad es una fiesta muy importante en Perú (Christmas is a very important holiday in Peru). 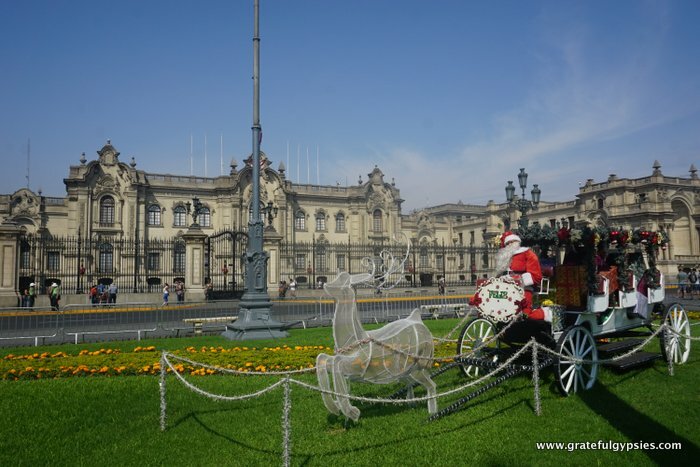 Christmas celebrations in Peru date all the way back to 1535 when the Spanish conquistadors brought Catholicism here. These days, about 75% of Peruvians identify as Catholics. In this post, we’ll take a closer look at what it’s like celebrating Christmas in Peru. In Peru, the big day to celebrate is December 24th. Christmas Eve here is called La Noche Buena (the Good Night), and it’s a time for families to get together for a big feast and to give gifts. Before the festivities, most people will attend mass. Known as Misa de Gallo (Rooster’s Mass), this actually starts at 10PM and not midnight. This way, people are home and ready to celebrate the official start of Christmas at midnight. The Plaza de Armas in Lima is ready for Christmas. La Noche Buena is a good night, and it’s also a late one in Peru. People typically wait until after mass to have a huge Christmas feast. The most common dish for a Peruvian cena de Navidad (Christmas dinner) is pavo (turkey). Those who can’t get a turkey may opt for pollo a la brasa (grilled chicken) or lechón (roast suckling pig) instead. Of course, there’s a wide variety of side dishes to choose from as well, including homemade tamales, applesauce, and a sweet bread called panetón. This Christmas delicacy was brought to Peru by Italian immigrants, and it’s now incredibly popular there. It’s usually filled with things like raisins and other candied fruits, and it’s everywhere you look in the lead-up to Christmas in Peru. The best way to enjoy it is alongside a cup of special holiday hot chocolate. Hot chocolate is actually a really big part of the Christmas celebrations in Peru, which may come as a surprise considering this is the start of summer here. Many communities host special events called Chocolatadas where less fortunate children are treated to cups of the yummy hot chocolate along with some tasty panetón. In case you’re wondering, Peruvian hot chocolate is usually homemade with cocoa, cinnamon, vanilla, cloves, condensed milk, and water. At midnight, adults will make a brindis (toast) with a glass of champagne, while the kids can participate with their hot chocolate. In many places, there’s a big display of fuegos artificiales (fireworks) that begins right at midnight. If you’re in Lima on Christmas Eve, you’ll be treated to a city-wide display that lasts quite a while. Watching the fireworks from the rooftop of our apartment in Lima last year was definitely one of my highlights of traveling in Peru. Enjoying the Christmas lights in downtown Lima. The party is just getting started here, as the festivities go well into the wee hours of the morning. Many people move the furniture around in their home to create somewhat of a dance floor for their holiday party. 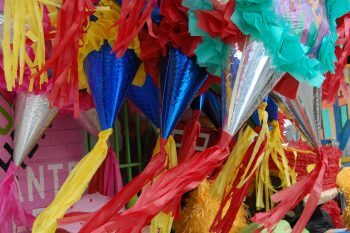 People exchange regalos (gifts) at the party, although people in some Andean regions wait until January 6th. They wait until then to exchange gifts in order to celebrate the arrival of Los Tres Reyes Magos (the Three Wise Men) who brought gifts to Jesus. While some people in Peru have taken up the custom of getting a Christmas tree, most families focus instead on their pesebre (nativity scene). Gifts are placed around the manger instead of around a tree in most homes. These are set up a few weeks before Christmas. A big tradition here is adding the figure of baby Jesus to the manger on Christmas Eve, which is usually done by the youngest child. A nativity scene in Lima. If you stumble upon a nativity scene in Peru, you may notice the use of animals such as llamas and alpacas, a true Andean twist on the Christmas story. Many nativity scenes also feature Mary and Joseph dressed in indigenous clothing. With the party often going until sunrise, Christmas Day is typically spent sleeping in and recovering. Children enjoy spending the day playing with their new toys, and there’s still plenty of sweet bread and hot chocolate to enjoy. With all of the big Christmas celebrations out of the way, December 25th is actually a pretty relaxing day in Peru. It’s a very festive time of year. Those who have a little Christmas hangover might go for the hair of the dog by making up a traditional holiday drink called algarrobina. It’s basically Peruvian egg nog, as it’s made from pisco, condensed milk, egg yolks, and the algarrobina syrup for which it’s named. A little cinnamon is then sprinkled on top when it’s all mixed up. ¡Salud! If you’re traveling to Peru for Christmas, be aware that most businesses are closed. Some bigger hotels host a special Christmas Day dinner, so at least you won’t go hungry. When we celebrated Christmas in Lima last year, we ended up going out for Chinese food and seeing a movie as they were the only places that were open. One of the most interesting Christmas traditions in Peru is the market in Cusco known as Santuranticuy. This bustling market takes place on Christmas Eve in the city’s Plaza de Armas. Artisans from all over the country come here to sell Christmas handicrafts. Of course, there’s plenty to eat and drink here as well. Celebrating Your Birthday- Mexican Style!